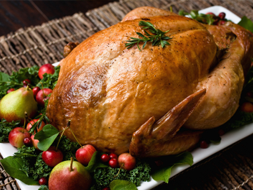 Loosen the skin and pull back off the turkey. With a spatula, apply half of the Sonny & Joe’s® Hummus to the breast of the turkey. Gently replace the skin, patting down over the layer of hummus. Combine the spice mixture and rub on the turkey skin. Drizzle olive oil over the turkey skin and massage in so that it spreads all over the turkey. Roast turkey according to size. Use the remainder of the Sonny & Joe’s® Hummus as a tasty appetizer with crudite, chips or crackers.